1981-01-05. New. Ships with Tracking Number! INTERNATIONAL WORLDWIDE Shipping available. Buy with confidence, excellent customer service! 1988-04-06. New. Ships with Tracking Number! INTERNATIONAL WORLDWIDE Shipping available. Buy with confidence, excellent customer service! Penguin Books, 1988-12-01. Paperback. Used:Good. 1981-01-05. Good. Ships with Tracking Number! INTERNATIONAL WORLDWIDE Shipping available. May not contain Access Codes or Supplements. May be ex-library. Shipping & Handling by region. Buy with confidence, excellent customer service! McClelland and Stewart. Hardcover. 0771012446 New Condition. . New. Penguin Books. PAPERBACK. 0140108882 New Condition. . New. Flames Across the Border, 1813-1814. McClelland & Stewart, 1981., 1981. NAP. 492p. Maps. Jacket priced. In mylar. Fine/Near Fine Copy. Hardback. Fine/Near Fine. Book. 1988-04-06. Good. Ships with Tracking Number! INTERNATIONAL WORLDWIDE Shipping available. May not contain Access Codes or Supplements. May be ex-library. Shipping & Handling by region. Buy with confidence, excellent customer service! Toronto, ON, Canada: McClelland & Stewart, 1981. 492pp, including Index, clean and bright. Illustrated end papers. Clipped DJ has light edge wear. '..an engrossing account of the war that shaped modern Canada. In this second volume, dealing with the campaigns of 1813 and 1814 we meet again some fascinating characters.. Gift inscription ffep.. First Edition. Hard Cover. Very Good+/Very Good. 8vo - over 7¾" - 9¾" tall. Toronto, 1980 & 1981: McClelland & Stewart The two volumes of Berton's books on the War of 1812. Special edition for collectors bound in faux blue leather decorated in gilt and beige cloth, in a slipcase. First book is fine in fine slipcase. Second book has a small corner bruise to front cover, else fine. Slipcase has small soil spot to beige label on fron panel, else fine. Note: 3 kg parcel, extra shipping may be required. . First printings. Hardcover. Octavo. Flames Across The Border 1813-1814. McClelland and Stewart Canada., 1987. First Edition 4th Printing.. Hardcover.. 9 3/4 x 6 1/2 x 1 5/8.. NON SMOKING STORE. My listing includes PHOTO OF ACTUAL BOOK for sale. Book NEVER OPENED. Book interior AS NEW, Dust Jacket Very Fine. Book has white boards and red cloth spine, gilt lettering, image of a cannon in white embossed on white cover. Dust jacket is NOT PRICE CLIPPED, has about three miniscule creases, and small almost invisible scuff in places from the adjacent book. Black/white maps. Rag edge pages. Illustrated end pages. Edition: First Edition 4th Printing. McClelland and Stewart. Hardcover. 0771012446 Like New Condition. . Fine. Toronto, ON, Canada: McClelland and Stewart Limited, 1981. Second Edition, signed and gifted by author. Hardcover. Very Good in Very Good, but Torn DJ. Embossed cloth white and red boards with gilt lettering on the spine. Gifted by the author on the title page. Illustrated endpapers. Numerous maps. The DJ has four tears to one inch but is not price-clipped. 492 pages. Toronto: McClelland & Stewart, 1983. With 36 maps. Once again Pierre Berton has drawn on contemporary accounts, diaries, letters and memoirs to recapture the feel, the smell, the sound and the horror of a half-forgotten war. This is his second volume of the war between the United States and Canada and deals with the campaigns of 1813 and 1814. Natural colour boards with red cloth spine. Gilt lettering to spine. Illustrated endpapers. Bookplate to ffep. Price intact dust jacket illustrated by Gerald Sevier.. Third Printing. Hard Cover. Near Fine/Very Good. Toronto: McClelland and Stewart, 1980. Book. Very Good (Book condition). Hard Cover with Jacket. Signed by Author(s). A clean, sturdy copy, signed by the author. Wear to dust jacket..
Toronto, Ontario: McClelland and Stewart, 1981. Book. Very Good+. Hardcover. Signed by Author(s). Canadian First. 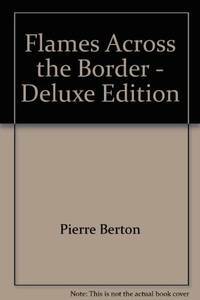 Signed and dated Dec, '81 by Pierre Berton on the title page with no inscription; some edge wear to boards and dust jacket; otherwise a solid, clean copy with no marking or underlining; collectible condition; illustrated with black and white maps..
Flames Across the Border 1813-1814, Pierre Berton. Published by McClelland and Stewart, Toronto, 1981. First Edition. Signed and dated by Pierre Berton across top of title page. 8vo up to 9½" tall. 492 pages including bibliography, index, illustrations and 36 maps. Quarter orange cloth with gilt spine titles over cream paper covered boards with blind stamped flag illustration front; pictorial endpapers. Volume is in fine condition without marks, tears or fold and firm binding. Unclipped jacket has taped and closed tears. Topics include: The Capture of Little York; Stalemate on the Niagara Peninsula; Siege of Fort Meigs; Contest for Lake Erie; Retreat on the Thames; Assault on Montreal; Struggle For The Fur Country; The Last Invasion in 1814; The Burning of Washington; Battle of Lake Champlain; Ghent. Canada: McClelland and Stewart, 1981. 1st Edition . Hardcover. Fine/Very Good. Used, hardcover, first edition, 1981, 492 pages. Condition: fine, jacker: very good. A few small tears on the edge of the jacket. McClelland and Stewart, 1981-01-01. First Edition. Hardcover. Very Good. Hardcover with dust jacket. Pages are clean and unmarked. Covers show very minor shelving wear. Binding is tight, hinges strong. Dust jacket shows edge wear. ; 100% Satisfaction Guaranteed! Ships same or next business day! McClelland and Stewart. Used - Good. Ships from Reno, NV. Shows some signs of wear, and may have some markings on the inside. 100% Money Back Guarantee. Shipped to over one million happy customers. Your purchase benefits world literacy! McClelland and Stewart. Hardcover. 0771012446 . Good. 1981. McClelland and Stewart, 1/1/1981. Hardcover. Very Good. Hardcover and dust jacket. Good binding and cover. Shelfwear. Foxing to page ends. Clean, unmarked pages. Ships daily. Little Brown & Company, 1982. Hardcover. Acceptable. Disclaimer:A readable copy. All pages are intact, and the cover is intact. Pages can include considerable notes-in pen or highlighter-but the notes cannot obscure the text. Little Brown & Company, 1982. Hardcover. Good. Disclaimer:A copy that has been read, but remains in clean condition. All pages are intact, and the cover is intact. The spine may show signs of wear. Pages can include limited notes and highlighting, and the copy can include previous owner inscriptions. At ThriftBooks, our motto is: Read More, Spend Less.Dust jacket quality is not guaranteed. Penguin Publishing Group, 1988. Paperback. Acceptable. Disclaimer:A readable copy. All pages are intact, and the cover is intact. Pages can include considerable notes-in pen or highlighter-but the notes cannot obscure the text. Penguin Books. Used - Acceptable. Shows definite wear, and perhaps considerable marking on inside. McClelland and Stewart. Used - Good. Good condition. Good dust jacket. McClelland and Stewart. Used - Good. Ships from the UK. Former Library book. Shows some signs of wear, and may have some markings on the inside. 100% Money Back Guarantee. Your purchase also supports literacy charities. Mcclelland & Stewart, 1981. Hardcover. Very Good/good. Mcclelland & Stewart, 1981. Hardcover. Very Good. McClelland and Stewart, 1981. Hardcover. Acceptable. Disclaimer:A readable copy. All pages are intact, and the cover is intact. Pages can include considerable notes-in pen or highlighter-but the notes cannot obscure the text. At ThriftBooks, our motto is: Read More, Spend Less.Dust jacket quality is not guaranteed. McClelland and Stewart, 1981. Hardcover. Very Good. Disclaimer:A copy that has been read, but remains in excellent condition. Pages are intact and are not marred by notes or highlighting, but may contain a neat previous owner name. The spine remains undamaged. At ThriftBooks, our motto is: Read More, Spend Less.Dust jacket quality is not guaranteed. Penguin Publishing Group, 1988. Paperback. Very Good. Disclaimer:A copy that has been read, but remains in excellent condition. Pages are intact and are not marred by notes or highlighting, but may contain a neat previous owner name. The spine remains undamaged. At ThriftBooks, our motto is: Read More, Spend Less.Dust jacket quality is not guaranteed. McClelland and Stewart. Hardcover. 0771012446 Good Condition. Has tearing. Five star seller - Buy with confidence! . Good. McClelland and Stewart. Hardcover. POOR. Noticeably used book. Heavy wear to cover. Pages contain marginal notes, underlining, and or highlighting. Possible ex library copy, with all the markings/stickers of that library. Accessories such as CD, codes, toys, and dust jackets may not be included.